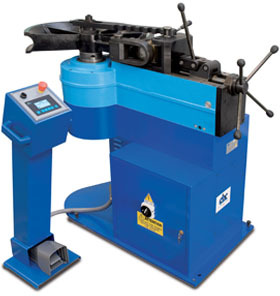 The UNI 89 is an accurate and powerful bending machine able to bend large diameters pipes. The optimal and constant bending radii do not deform bent pipes: it is the ideal machine to satisfy every user’s exigency in the plumbing, boating, hydraulics, industry and plants installation in general, above all in the ornamental field. - Digital electronic unit with display for the programming and control of required bending angle. Memory up to 50 bending programs with the possibility to make for each program up to 9 bending angles in sequence. - Sizes: length 1200 mm., width 650 mm., height 1200 mm. With two additional interchangeable shafts in the standard equipment.